We got a call Tuesday night from one of our really nice tenants. She is an older, single woman living in a townhouse near downtown Seattle on First Hill. She was calling because she had just been carjacked!!! She was sitting at a stop sign when a group of thugs smashed in her passenger window, grabbed her purse, and took off. I did not ask her for details (she was stressed out as it was), but she told me that within 40 minutes they had racked up $1,000 in charges on her credit card while in Redmond, 17 miles away! That is some fast work. The police told her they thought the guys were professionals at what they do. Needless to say, she was pretty upset. Not only did they get her credit cards, but also her address and house keys. So she had to get her locks changed late at night. To make matters worse, it was her birthday! First and foremost, be vigilant. Be aware of the situation. If you are alone in a car and night has fallen then you need to understand your risk is higher. 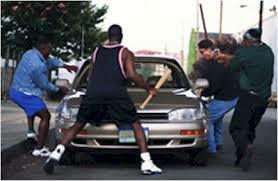 If it is in the inner city your risk is higher, though I am sure carjackings occur in the suburbs and beyond. Second, if you notice a group of 3 or more “young men” be on the alert. I didn’t get details, but this is how I see the episode going down. A group of kids or young men cross the street. Just as they approach the part of the crosswalk where you are parked, one stops in front of the car (so you won’t run him over) while his accomplice or accomplices smash in your window with a baseball bat. At this point you are so mortified that it is easy pickings to grab the purse, iPad, or anything else on the front seat. So it could be just even two people. They will likely have a baseball bat or something to smash the window with. The earlier you see this kind of situation developing the greater your chances of prevention. 1) Lock your doors and windows. This will at least take out the thugs who left their bat at home! 2) Place your purse and other valuables under the car seat, out of sight and out of reach. 3) Shift the car in reverse if you see a potentially dangerous situation developing. Obviously if there is a car behind you then this option won’t work. But if you are all alone on the street then you are a more likely target so get ready to hit the gas and peel out of there! 4) Have your camera phone ready. Take pictures of suspects before they become suspects. In the heat of the moment you won’t have time to finid your camera and take a picture of 3 kids running away from you (like that will do any good anyhow!). So have your camera ready and snap, snap, snap. 5) Have your phone ready on 9-1-1. This won’t help much as the thugs will likely be gone by the time someone responds. But it is worth a shot. 6) Honk your horn. Maybe you’ll attract attention from a good Samaritan who can help. We don’t hear about carjackings too often, but if these guys were professionals then it is obviously happening at a rate that is worth noting. Hopefully by sharing information and being prepared we can thwart would-be carjackers. For more information, go to http://www.state.gov/m/ds/rls/rpt/19782.htm for tips from the US Dept. of State. Best of luck. Disclaimer: The thoughts and ideas in this article are those of the author and do not represent the thoughts or opinions of Full Service Property Management. Furthermore, the author has no experience with carjackings and cannot validate nor take responsibility for the ideas expressed herein. Readers are strongly encouraged to talk to the police and do independent research before developing a plan for preventing carjacking.